R would eat pizza for dinner every night if we let him. When I am making out the weekly menu and grocery list I sometimes ask him what he wants for dinner. 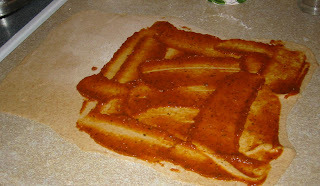 9 times out of 10 the answer is: pizza! 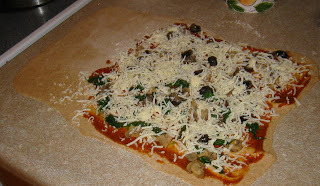 Then added sauce, leaving space to seal the bread at the end: Topped it with steamed spinach, mushrooms, olives and cheese: Rolled it up, sealing it with a coat of water on the roll and the flap that sealed over the dough, and baked it at 375 degrees for about 20-25 minutes. Wonderfully good and different! 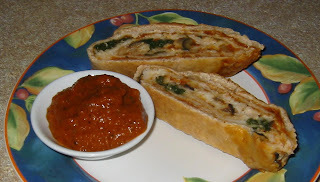 Bonus: R loved the idea of having "bread" for dinner and dipped it in the extra sauce. SPH loved it too, I did two breads, one with only veggies and one with a bit of crumbled bacon (about 2 slices on the whole dough) and a sprinkle of blue cheese. Ooooh, your bread sealed very nicely... because you left loads of room... I always forget and wind up with a mess that you can't take a picture of! Did you do an egg wash or anything on top... it's so pretty! Great idea, thanks! Just a quick note to tell you how much I've been enjoying your blog. Lots of great ideas.... I'm at claudiacummins.blogspot.com, if you're looking for another semi-local blog. Thanks! 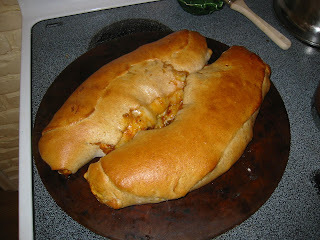 Yum, this looks so good it's making me hungry and I've already had dinner and it's late. I'll have to try this soon. Thanks! That looks really yummy! Thanks for sharing. Wow. I am totally telling Marc about this...that is a great idea! They look beautiful and I am sure tasted wonderful! I'm hungry!